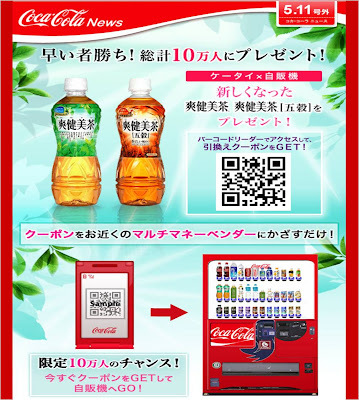 Coca-Cola have launched a QR code campaign in Japan to promote two new Coca-Cola tea drinks. Ads show a QR code and if this is photographed with a mobile phone, the photo can then be shown to a vending machine that will distribute a free tea. This is not the first time that Coca-Cola have used QR codes in Japan (they were part of the Sokenbichia re-launch last year), however the new Coca-Cola campaign is another great example of how versatile QR codes can be - offering more than just a link to a mobile site. This is also a good illustration of how mobile, micro-payments can operate and it will be interesting to see what happens as this gains traction in the UK. Nick - Great to see someone else evangelizing mobile tagging. We're focused on tag management, that is linking tags to useful information and content, and we offer individuals the ability to create up to six different types of 'Vizitag' for free at our site Vizitag.com - please check it out. We are using Microsoft tags rather than QR codes but the principles are the same.